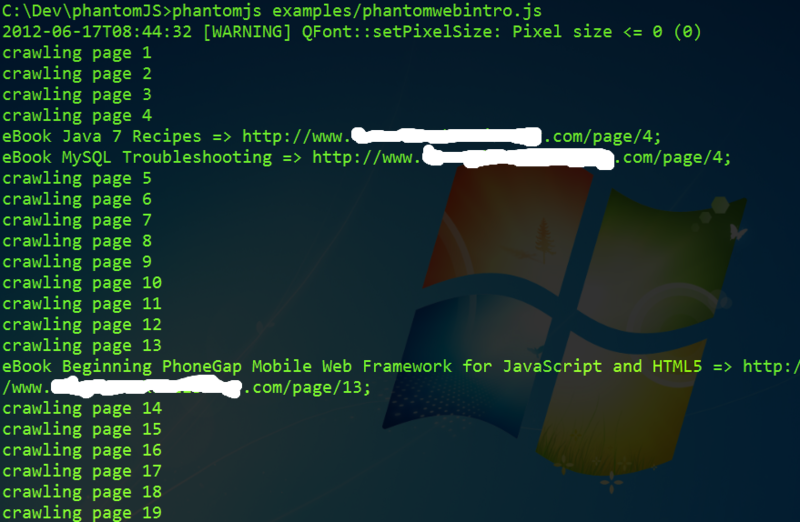 A couple of weeks ago, a colleague of mine showed me this cool tool called phantomJs. This could be really useful for tasks like running ui tests on a project you created, or crawling a set of web pages looking for something. ...So, this is exactly what i did! There's a great site I know of that has a ton of great ebooks ready to download, but the problem is that they show you only 2 results on each page, and the search never finds anything! I added comments to try to make it as clear as possible. Feel free to contact me if it isn't. I hid the real website name from the script for obvious reasons. This technique could be useful for a variety of things, but you should check first about legality issues. I also added an interval of 3 seconds between each website crawl. Another precaution from putting too much load on their site. You could also use the CasperJS wrapper and have the script automatically download those files for you. Im trying out your script. Same website and keywords FYI. But theres no output. I tried lowering to just 2 pages. Left it for 10 minutes still nothing. I don't know what could be the problem - is there no output at all ? 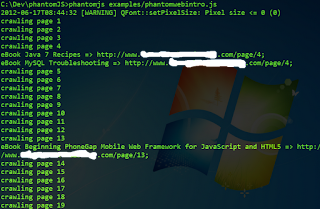 Maybe something is blocking the phantomjs from making requests on your machine, like a firewall or something of that nature. Do other phantomjs scripts work for you ? Did check the firewall. Will check some other settings. I did try the countdown. Going to try some of the others.